GET A Healthy Smile for Life! Only the best is good enough! 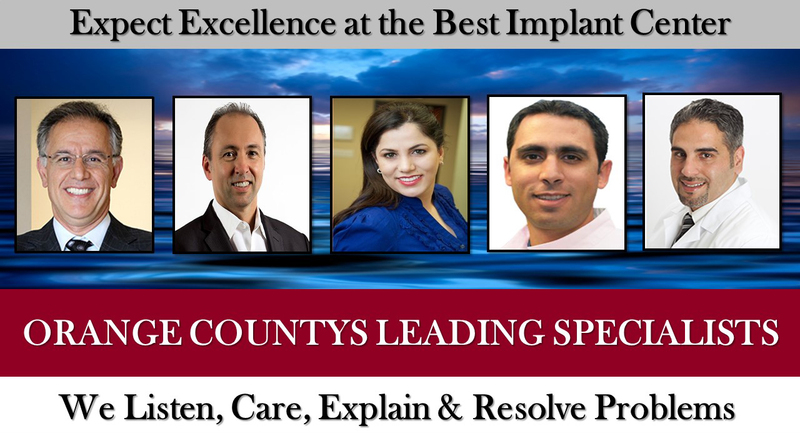 Welcome to the new era in holistic implant and cosmetic dentistry. Healthy and beautiful teeth contribute significantly to our quality of life and well-being. They are an essential part of our appearance, confidence, and daily eating habits. The important parts of the smile reconstruction process are choosing the most professional and skilled dentists as well as the right and highest quality materials at hi-tech dental practice of Aria Dental. The standard for replacing a missing tooth is the Titanium Implant. However, Zirconia implants have been available on the European market for years and now been used as an alternative to titanium dental implants. Zirconia was discovered in 1789 by the German chemist M.H. Klaproth but rediscovered only in the latest decades because of its unique properties. Zirconia is a very hard material and has excessive tensile strength. Because of its high bio-compatibility, it is used in medicine for hip replacement and in dentistry for posts, crowns, implant abutments, and dental implants. Zirconia has similar color to teeth and is bio-compatible making it an alternative and suitable material in implant dentistry especially when metal allergy, esthetics, metal in one’s body, and being holistic is one of the concern. Zirconium dental implants also known as white implants or all ceramic implants are made of special ceramic (Zirconium Oxide, ZrO2) that is used in the spaceships because of its high resistance to fracture and heat. Zirconium dental implants are biologic and entirely hard and soft tissue-friendly; there no allergic reactions and no sensitivity to temperature. Zirconium dental implants have a tooth color-like appearance and has an esthetic advantage over titanium implants. Good esthetic results can also be obtained with titanium implants when ceramic posts and crowns are used. Ceramic implants could minimize the inflammation. HOLISTIC: It is no longer necessary to implant Titanium or any other metal to have fixed teeth. 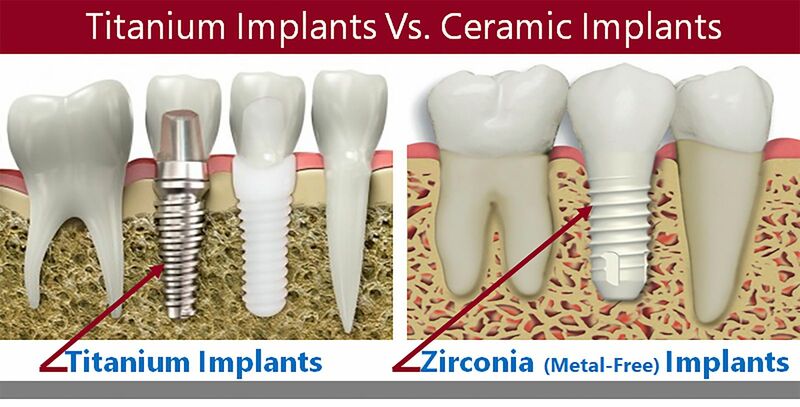 Zirconia implants are a holistic solution for metal-free dentistry. Zirconia dental implants are a viable alternative for patients who are not comfortable with or are not able to tolerate metal implants in their mouths. AESTHETIC: The white color of Zirconium substitutes the metallic appearance of Titanium. The dark line around the gum disappear. HYGIENIC: Ceramic Implants and crowns display low plaque and calculus retention than Titanium, therefore, promoting healthier gums and less gum recession or shrinkage. DURABILITY: Zirconia implants do not corrode and will not have any impact on taste in the mouth. SHORTER SURGERY: Metal-free Zirconia dental implants are designed so that they can possibly be placed immediately following a tooth extraction. This one-stage surgery reduces the amount of time it takes to place the implants to maximize our patients’ comfort. A less invasive surgery also results in shorter recovery time and less pain during in the days to follow the procedure. RESISTANCE: Zirconium dental implants which is a biocompatible material, do not usually corrode when place into a wet environment like a mouth or when fluoride is added. BIOCOMPATIBLE: Zirconium is an inert material with very low allergic potential. OSSEOINTEGRATIVE: Zirconia implants have proven high level of osseointegration (meaning to provide optimum integration with the bone), confirmed in numerous studies in Germany and the United States, although not as high as Titanium. Can Any Dentist Place Zirconia Dental Implants? Theoretically, may be. However, ceramic implantology has now propelled dental implantology further into the realm of esthetic and cosmetic dentistry. Zirconia Implants unlike Titanium Implants are one-piece; thus, their placement angle and position are extremely critical and must be very precise. Unlike two-piece titanium implants errors in implant placement cannot be corrected with angled abutments (posts). Therefore, any surgeon involved with these implants should have a high level of prosthetic awareness. At Aria Dental, the Zirconia Dental Implants are placed by an Ameican Board-Certified Periodontist who has more than 20 years of dental experience and specializing in Zirconia Dental Implants and the highest quality of crowns are restored by top cosmetic dentist. 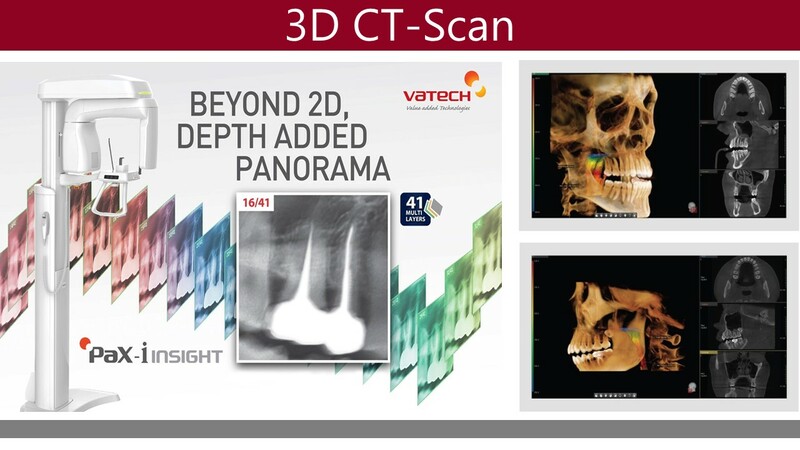 We utilize enhanced diagnostic tools and surgical preparation steps such as three-dimensional CT-Scan and virtual planning and computer-generated surgical guides. When teeth are made from artificial biomaterials, it is essential to use ceramics of uncompromised quality in terms of appearance, mechanical strength, and functional safety. Oxide ceramic have been proven effective in all fields. Since the 1980s, when zirconia implants were proposed for use in dentistry due to success with hip implants, important progress has been made to assure zirconia’s safety and success. Zirconia ceramic implants have also been recommended as the preferred implant for tooth replacement by the holistic community.